Over Thanksgiving weekend Jacob's parents kindly let us stay at their house in Astoria for a couple days with the mutts. 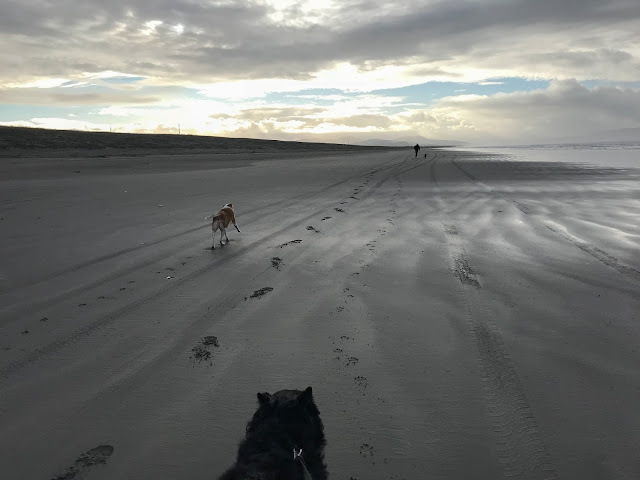 The first thing we did was tire the mutts out on a bird-less stretch of beach so we could do some birding without them in the afternoon. After having lunch we stopped at the Hammond Boat Basin on our way to Fort Stevens. A Red-throated Loon was hanging out close-ish to shore. From there we headed to the south jetty at Fort Stevens and spent a lot of time walking the edge of the beach grass looking for longspurs and buntings. We scared up a couple of birds, one of which was probably a longspur. A big flock of Least Sandpipers and a rainbow appeared on the walk back to the parking lot. 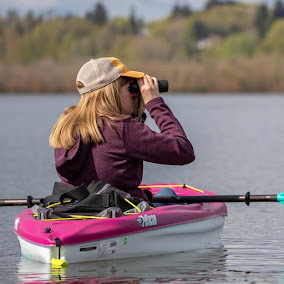 Last weekend Jacob and I went out to Gilliam County to complete my first raptor survey of the season for East Cascades Audubon Society. I chose to do the south route that begins in Condon and ends in Arlington with 150 miles in between. 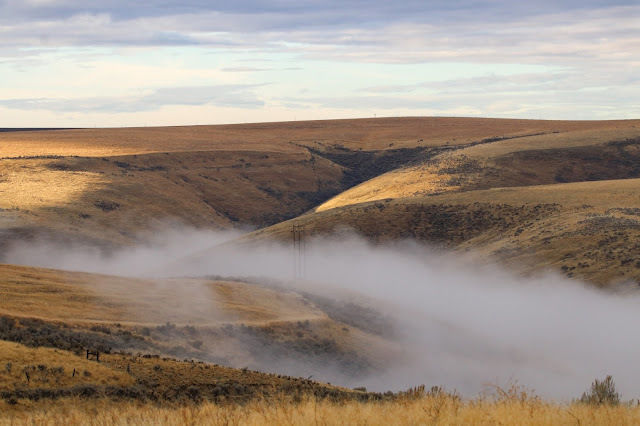 Distractions are abundant out there and before we even reached Condon we stopped to check out some Chukars and then some impressive fog. This is my third winter doing raptor surveys out here and I warned Jacob that numbers are usually pretty low, only about 25-30 raptors all day. That includes all hawks, falcons, eagles, and owls. Things started off mellow with a young Northern Shrike on Airport Road. We got started on Hale Ridge Road when a rabbit appeared in the road. A big rabbit. It hopped off into the tall grass but I managed enough photos to identify it as a white-tailed jackrabbit. Life mammal!!! 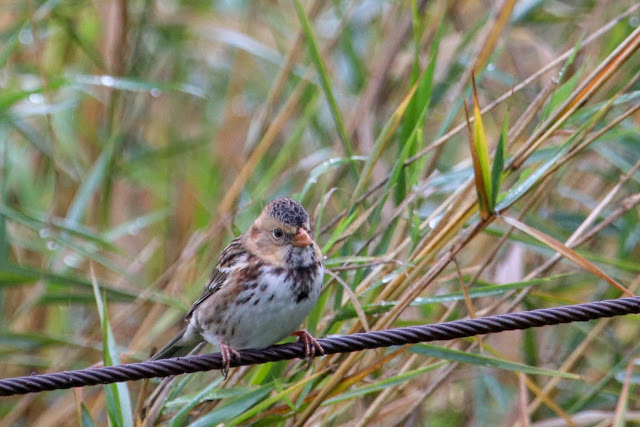 Last week Jacob and I went up to Ridgefield to look for a reported Harris's Sparrow in the rain. He found it easily. Yesss! This was Clark County bird #200 for me, and Jacob's life bird #299. Exciting numbers. There were other fun birds around like a flock of 50 Wilson's Snipes and this sneaky American Bittern. We saw some geese fly and I noticed one had a red neck band. I took a ton of photos of it with hopes of being able to read the band. Success! Another photo showed the rest of the code and I sent it off to the Bird Banding Lab that day. By evening I had details on the bird (so much faster than they used to be!). At least 8 years old! Pretty cool.